How can you not be happy when you see all of these yellow tulips? Inpsiration can come at the funniest times . . . this table is a perfect example. I was looking for small pots for flowers and wanted them all to match, when I realized I would have to buy a lot of them to fill my table. That’s when I came up with the idea of having a garden variety, which just meant I would use every pot I had, regardless of the color, material, size or shape. 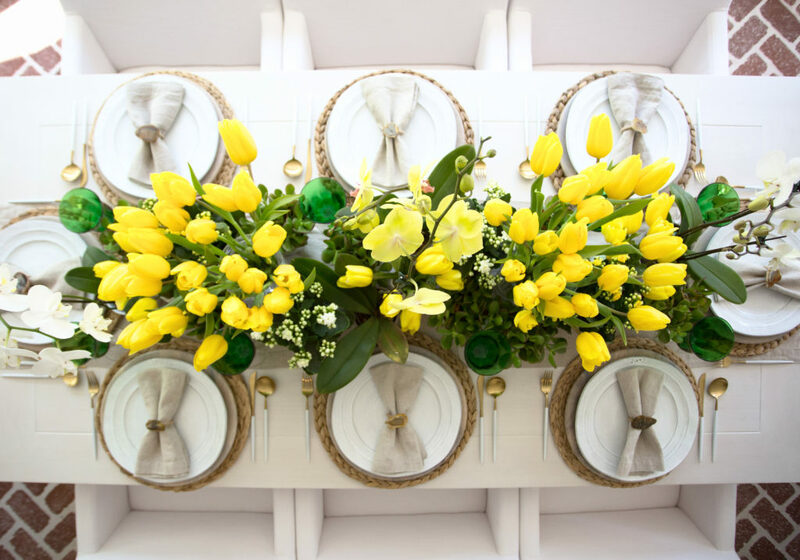 And I loved how my Yellow Tulip Table turned out! 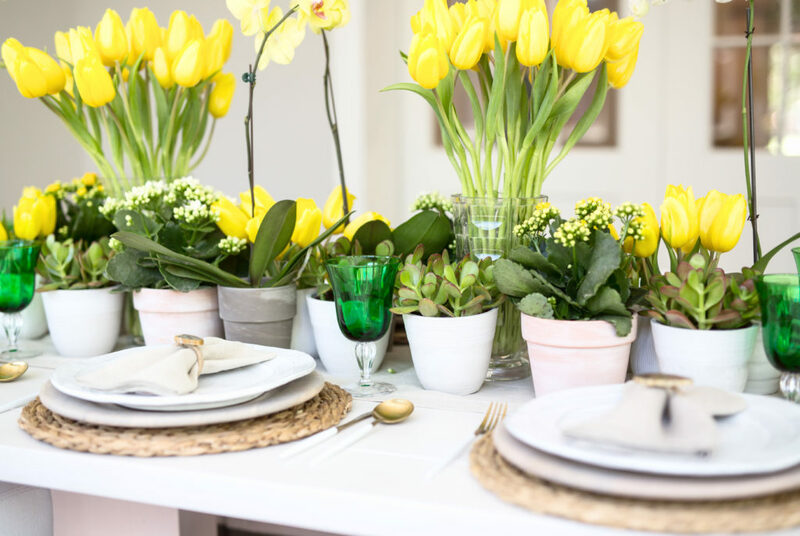 Practically bursting with yellow tulips – this table is definitely is dose of sunshine! 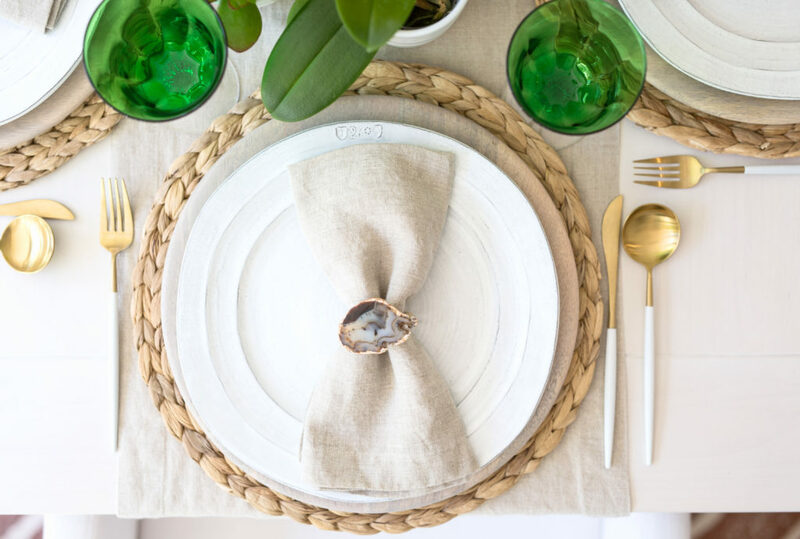 My bright, light sunroom was the perfect locale for this table setting. It’s surrounded by windows, which allows all of that beautiful sunlight to stream through! Varying heights of the flowers give the table some interest. 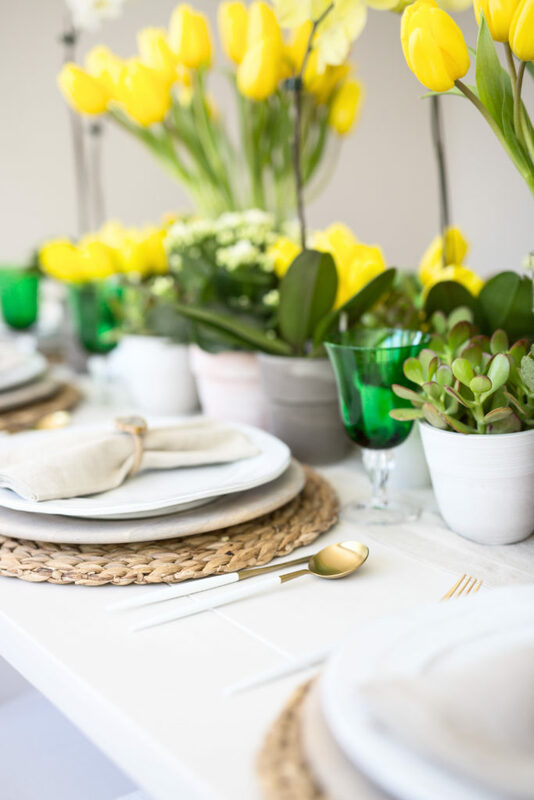 I’ve used yellow tulips, white orchids, yellow orchids, succulents and flowering plants to create a garden feel to this table. My secret to finding great flowers and plants is Trader Joe’s! 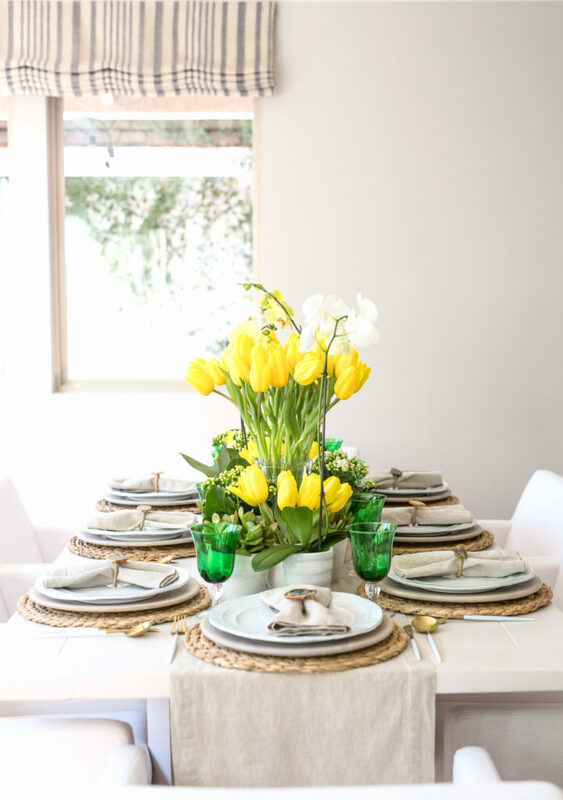 Yellow and green are fun, happy colors that are easy to work around while the neutral linen table runner grounds the bright hues to enhance them, rather than distract from the playful theme. White ceramic, terra-cotta, and gray stone pots combine to make a pretty array of vessels. You don’t have to match your pots to make it work – most gardens are full of different elements already! Massaging the tulip petals can help open them up – just be gentle! Don’t worry if your flowers and pots aren’t the same variety or type – this table goes to show you that you can mix and match. Variety is the spice of life! I also love to repurpose flowers throughout my house after I’ve used them on a table. Here’s my Spring Home Tour post that shows how I’ve done it. 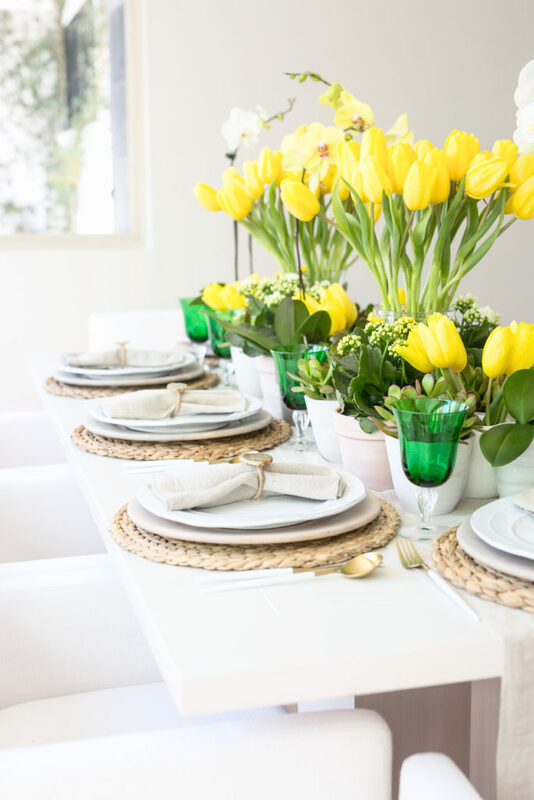 Hope you’ve enjoyed this dose of sunshine to inspire your next yellow tulip table!